Mintzer gives this Duke Ellington classic a different treatment than the customary ballad feel for medium advanced groups. Set in a slow and easy gospel-like feel, the rhythm section will, in Bob's words, get a groove on just by reading the written parts. 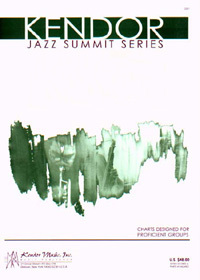 A tenor saxophone soloist is featured throughout, which requires the player to use an R & B style while superimposing jazz harmonic sensibility over the solid, repetitious beat provided by the drummer. Duration 5:30.